send me the recipe for the sweet pea bruschetta and a little “tid bit” and we’ll get this sucker going!!! I’m trying to figure out the software. It won’t let me put up two “About me’s”, one for each of us. So we will just have to figure out one together. let me know what you think!! was surprised by how nice the format was to begin with. Now we gots to start posting!!!! Two weeks prior, I had volunteered Phoebe to co-throw a cocktail party for our best friend Jordana’s 24th birthday. After that, we must have been talking about how much we liked cooking and what we should do with that affection, because although I have no gmail evidence of it, I don’t remember being completely aghast when I got the above email from Phoebe. The record is a little hazy. As far as we can piece together, she was talking to her cousin Sarna at her Thanksgiving table about the emptiness of corporate work. Her cousin, ever logical, said, “Well, what would you rather be doing?” Phoebe said, “cooking.” Her cousin answered, ever logical once again: “Well, why don’t you do something about that.” And then the next morning, still full and with food on the brain, she created a Blogger account (which seemed as complicated back then as it does simple now), and sent this email. And the rest is history. rolling filling into rice-paper for summer rolls (couldn’t have done it without you, Sarah!). 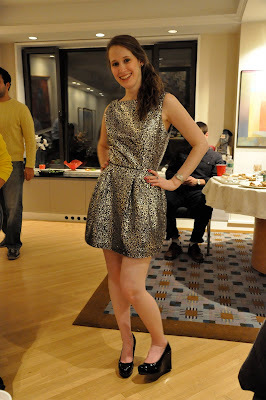 And then there was the birthday girl herself, in a dress of her own design and construction. You wouldn’t know it to look at her, but she ate most of those bowls of peanut udon noodles. As we carried out the cupcakes to Jor and sang an off-key rendition of Happy Birthday, we caught each other’s eyes: it was our birthday, too! 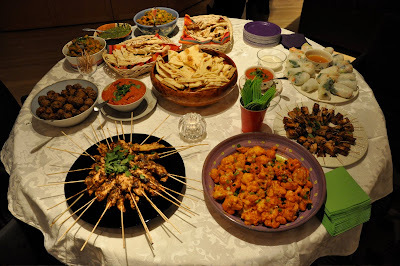 After the success of my birthday meatballs, I felt inclined to put an Asian spin on my winning recipe for Jor’s Indian-esque buffet. In place of basil and parsley, cilantro. Instead of ketchup and Parmesan, red chili paste and ginger. *use 2-3 tbsp of the Thai Kitchen brand. Don’t add as much if using a more authentic brand, since it might be a lot spicier. In a large mixing bowl, combine all the ingredients for the meatballs and fold them together thoroughly with your hands. Roll the meat mixture into 1 ½ inch balls and place them next to each other on a cookie sheet lined with parchment paper or tin foil. They can be fairly close together, as they will not expand like cookies. 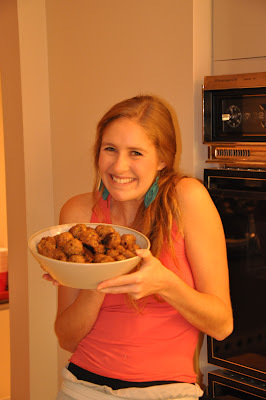 Bake them in the oven for 25-30 minutes, until tops have browned and the meatballs are cooked through. Meanwhile, in a Dutch oven or saucepan, sauté the onions until translucent and soft, about 8-10 minutes. Add the garlic and the ginger and cook for an additional two minutes. Carefully pour in the tomatoes, salt, chili paste, and cumin and stir to combine. Simmer over medium heat for ten minutes, until the mixture has thickened. Add the vinegar and simmer for another few minutes. Puree the sauce in a food processor or using an immersion blender until smooth. Stir in half the cilantro and use the remaining leaves for garnish. To serve, place the meatballs in a shallow bowl next to the tomato chutney and some torn naan. Let guests create naan meatball sandwiches, or just use toothpicks for dipping the balls in the chutney. These may be our most-requested dish, especially when Jordana is doing the requesting. We have her to thank for the lovely orange and green palette. You can quarter this recipe to make it for a smaller group–and definitely serve it as a main; don’t reserve it only for cocktail parties! Process the ginger and garlic in the food processor until smooth. Add the sugar to help smooth things out. Add the rest of the ingredients, up to the water and process until smooth. Add the water. If your food processor is small, you may have to do this in two batches. Set aside to let the flavors meld, at least an hour, or refrigerate overnight. When ready to make the noodles, bring an enormous pot of water to the boil. Cook the udon for a few minutes, as per package directions, then drain and add to the peanut sauce, tossing to combine evenly. Serve in small portions, topped with cucumbers or scallions. You can also make this sauce for plain wheat noodles (e.g. linguine), but you won’t get the sumptuous carbiness of the thick white udon noodles. *These are different than egg roll or spring roll wrappers, which need to be cooked. Find them cooked or fresh at specialty stores or in Chinatown. If dried, you’ll need to follow the directions on the package, moistening the circles in very warm water before adding the filling and rolling. Prepare the cabbage: cut the leaves and some of the white stems very fine. Layer in a colander, sprinkling kosher salt over each layer. Leave in the sink or on a plate to drain for 1-2 hours. Rinse, drain, and press out even more moisture by wrapping the cabbage in a dish towel. Have all the other ingredients prepped and in bowls in front of you. Prepare a rice paper wrapper as necessary, then add about 2 tablespoons rice noodles and a few carrots. Sprinkle a tablespoon or two of the cabbage, then a few herbs and a few peanuts. Don’t worry as much about neatness as about size: there shouldn’t be more than about 1/4 cup of filling total. Starting from one side, beginning rolling the filling in tightly, folding the sides in to seal. 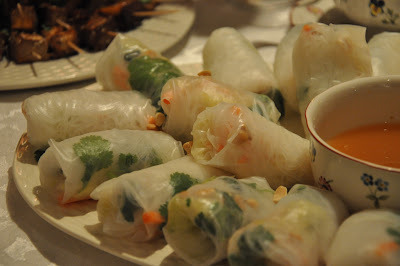 Arrange the rolls on a platter and serve with nuoc cham dipping sauce (below). In a large bowl, cover the potatoes with cold water. In a small food processor, purée jalapeños, ginger, garlic, curry powder, cinnamon, turmeric, ¼ cup vegetable oil, 1/4 cup water, honey, and 1 teaspoon salt until smooth. Transfer purée to skillet and cook over medium-high heat until fragrant, about a minute. Add the onion and cook, stirring occasionally, until it begins to soften, about 8 minutes. Drain potatoes, then add them to the onion mixture and cook over medium heat, stirring occasionally, until potatoes are barely tender, about 10 minutes. Add chickpeas and 1 1/2 cups water. Stir to combine, scraping up any brown bits from the bottom. Cook covered until the potatoes are completely tender and the water is absorbed, about 15 more minutes. Add peas and raisins, and cook until heated through. Remove from the heat and stir in the lemon juice, toasted coconut, and cilantro, saving some for garnish. In a food processor, pulse the garlic, shallot, ginger, cashews, and jalapenos until minced. Add the herbs, honey, lemon juice and ¼ cup of warm water and puree until smooth. Add the golden raisons and puree again, adding any additional water to thin the mixture to your desired consistency. It should be slightly thinner than a pesto. Garnish with mint and cilantro leaves, and serve alongside some naan. Congratulations, girls! I love reading the blog and all the amazing ideas it provides. 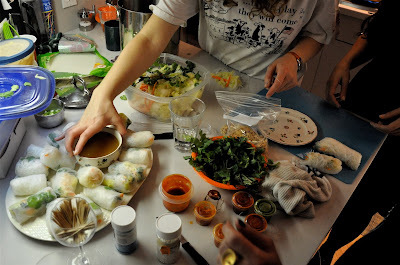 I also can't wait to try those summer rolls, which seem particularly refreshing after Thanksgiving and copious amounts of Thanksgiving leftovers. Congratulations again on such a wonderful first year! Happy Birthday, Phoebe and Cara! The photos are gorgeous (Alex), but can't fully capture the incredible warmth and enthusiasm you both exuded at Jor's 25th. You are great friends, great writers and great cooks!!!! Thanks for putting our small kitchen to such good use! Ooh, all of this sounds sooo good!! Especially the peanut noodles, a favorite of mine. Happy Blog-iversary, Cara & Phoebe! Happy Anniversary and a great story!! We have to meet sometime. Thanksgiving on the Vineyard was fun – but bad weather. Our ferry was canceled early yesterday, had to wait 4 hours for gale force winds to go away and the seas to calm. Hope you had a great tday! Do you have a recipe for the soy/sesame tofu satay? Thanks, everyone, for the congrats! 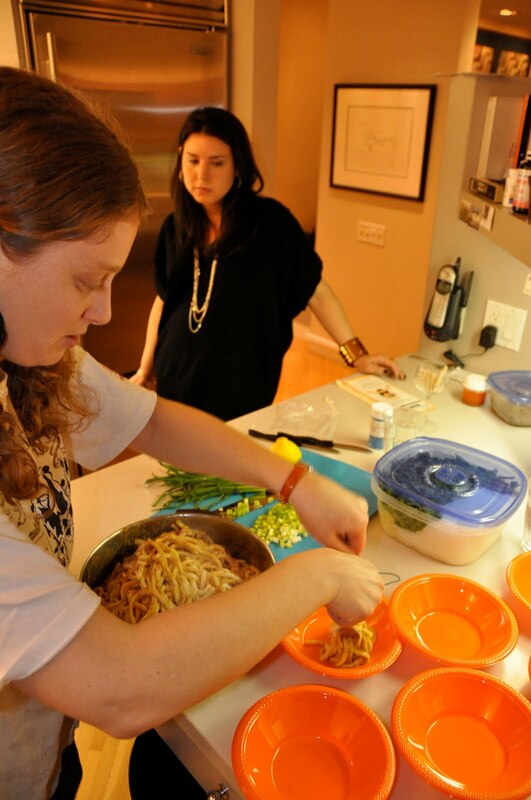 Sara–yes, we do, we just haven't quite had the stamina to write up all the dishes yet. We'll post it soon! Sara: Here is the post with a recipe for the tofu skewers. http://www.biggirlssmallkitchen.com/2009/12/big-girls-global-kitchens-asian-skewers.html Enjoy! I’m bringing the peanut noodles to a potluck and want to make the noodles and peanut sauce the night before and dress them right before we eat. How can I cook the noodles in advance so that they don’t get stiff, crunchy or dry? And how should they be stored? Thanks!